When traveling, I can’t very well work with temperamental and messy silver clay, but I can make sample designs in Sculpey. While flying home from our (fun!) Thanksgiving weekend in North Carolina, I made this to fulfill a request for a pug pendant. This is the most specific piece I’ve attempted. There is often an element of letting the clay guide me, but for this I worked from a photo. The grumpiness, I’m not sure where that came from! And it looks like a dog. But, a pug? I think I might have crossed breeds here. Do any of you, who know better than I, see some bulldog in the mix? 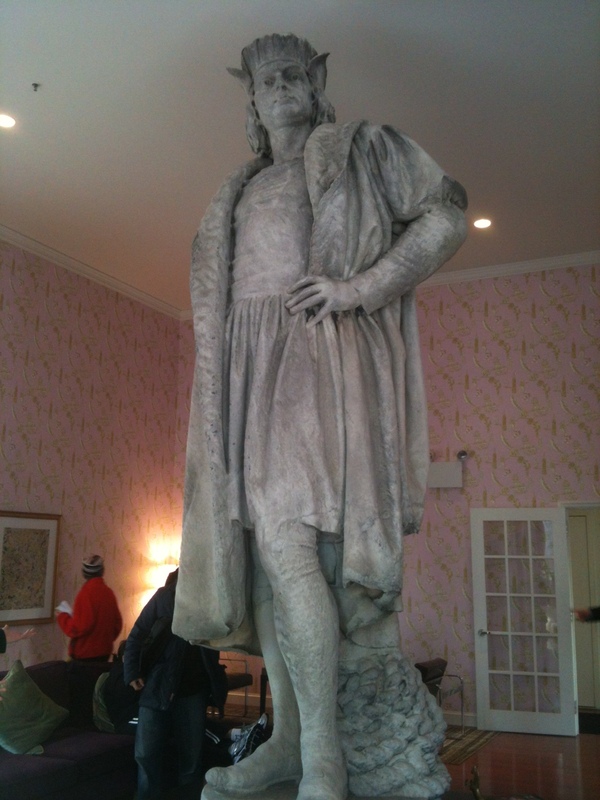 This morning we went to the Discovering Columbus exhibition in Columbus Circle. It’s really something. The Columbus statue, which has watched from high over the corner of Central Park since 1892, is enclosed in a temporary furnished living room in the sky, courtesy of the Public Art Fund and artist Tatzu Nishi of Japan. The room is at the top of six flights of stairs. It is outfitted with a flat screen TV, bookshelves, wall art, couches and chairs. What you can’t really see in these photos is that the custom pink wallpaper has an “American” motif, which felt saccharine and unnecessary (Elvis, Mickey Mouse, hotdogs, over and over again). 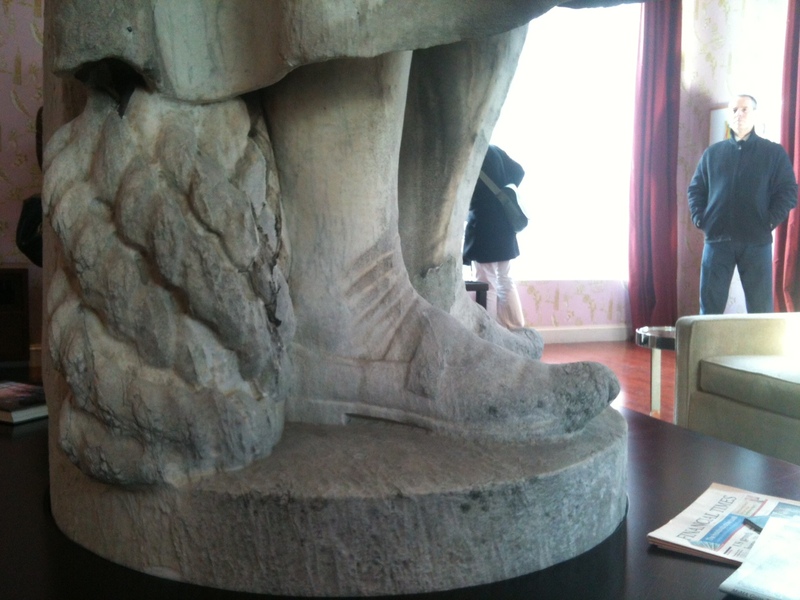 especially appreciated seeing the surface of the statue up close — what Italian marble sitting out in our sparklingly pure city air (haha) looks like after 100 years. Nothing we could have seen without this exhibition! Being there reminded me to recognize and consider parts of the world out of context from time to time. All the pieces are re-arrangeable and mixable, the possibilities only as finite as we can imagine them. 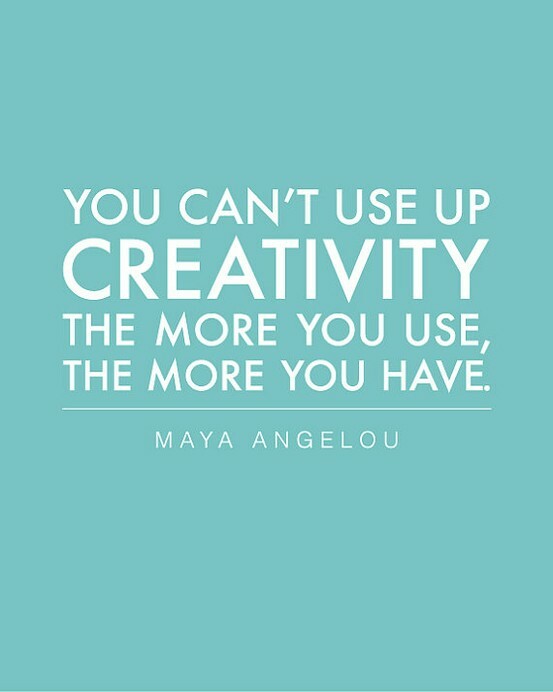 Cool, abstract thought for today. I recommend that New Yorkers go check it out before it closes on Dec. 2. Tickets are required but free. It’s worth it for the views alone! I have a slight fear of octopi, but I also find them fascinating. By turning them into a little critter with curly ribbon legs, I’m not afraid! Octopi, the supposed plural of octopus, is a favorite among fans of quirky words. But though it pains us to point this out, octopi is not etymologically correct. Octopus is of Greek, not Latin, origin, so its archaic plural would be octopodes, not octopi. Surprising but logical, although I’m not sure I’ll ever be able to speak the word octopuses and take myself seriously. I think I prefer octopodes! I’m moving this awesome piece of feedback over from Facebook. It really does make my day to receive messages like this. Received my Billy Goat jewelry today…I absolutely love it. I will wear it as my Badge of Honor…thank-you, Happy Trails! Hooray! This piece is special in my shop because the goat is modeled on the logo for Expedition Everest, a campaign to raise $500,000 for education for East Africa’s most desperate children. For each mountain goat necklace purchased, $10 will be donated to the cause, which is detailed below. Great people doing good, exciting work… all the way to the top of Everest, forpetessake! Expedition Everest is a campaign to raise $500,000 for Flying Kites, an organization dedicated to providing world-class education to East Africa’s most desperate children. The Expedition will also seek to put the first Kenyan on the summit of the world’s tallest mountain. Accompanied by Toby Storie-Pugh, founder and executive director of Flying Kites, and Mike Chambers, director of the Adventure Challenges program, the team will attempt to summit Mt. Everest via the South Col in the spring of 2014. In addition to raising funds to complete the Flying Kites campus, Mike, Toby and their Kenyan teammate (to be selected) aim to set an example for the children of Flying Kites that any goal is attainable if you dare to start and are determined to finish. Read about them and watch their inspiring video here http://expeditioneverest.org and more on Flying Kites here http://www.flyingkitesglobal.org. We went on an early evening leaf-gathering adventure, so that I can make some more one-of-a-kind silver pendants before winter sets in. Most of what is left now is crunchy and brown, but with careful looking in the semi-dark, we found enough to keep me busy the rest of tonight. 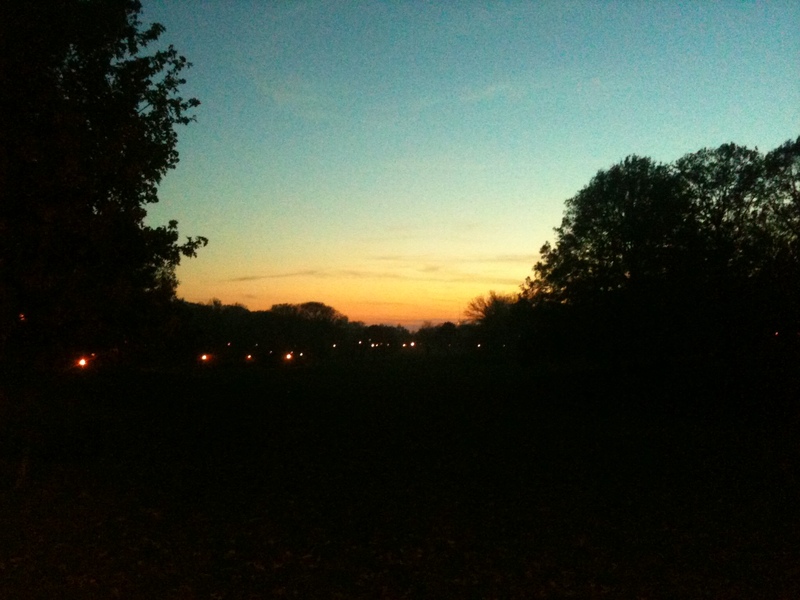 The park is beautiful in all its seasonal variations, but tonight we made two melancholy observations. 1. It’s getting dark so early. Too early. We were back inside by 5:24 and I felt like it was time for us to get ready for bed. But… must…remain…productive. 2. 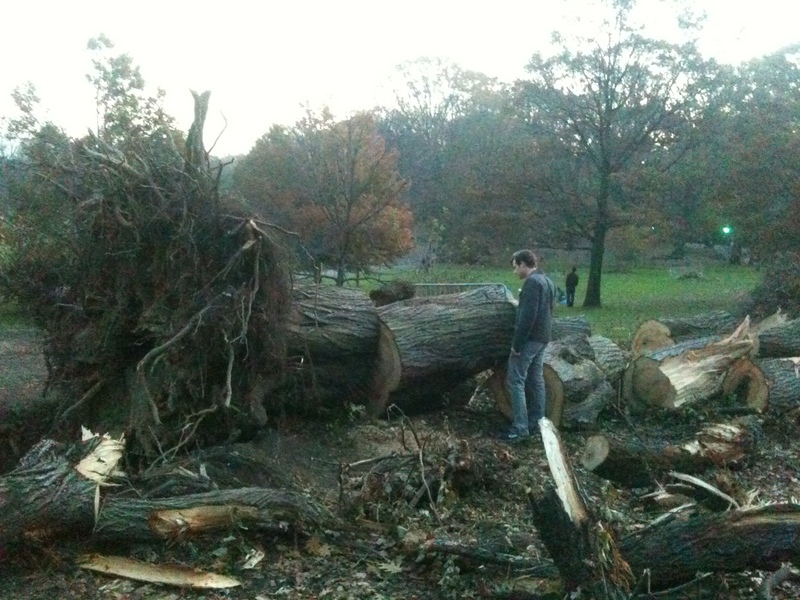 The park really suffered in Sandy. There are downed branches of all sizes stacked and piled throughout the area. Not all of the branches have been stacked up, either, and wind-blown caution tape is tied here and there. Such a big clean up job, I’m sure. 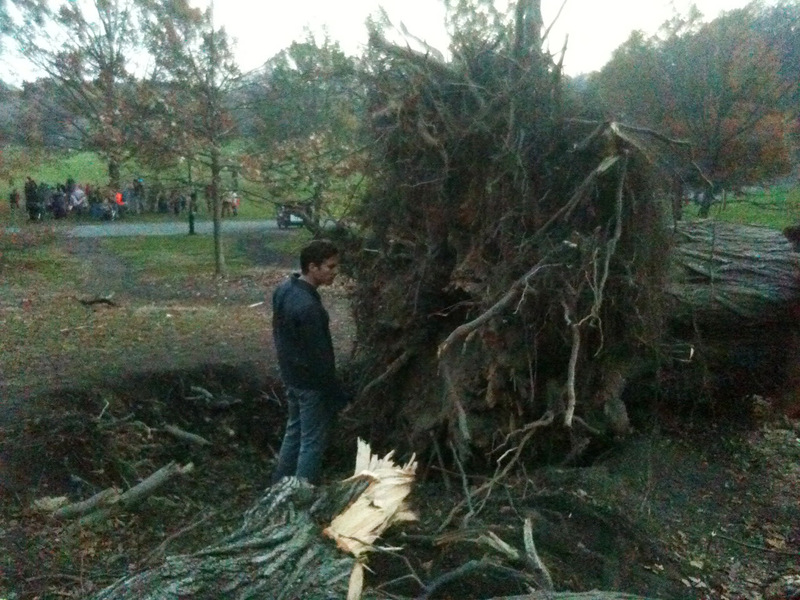 And what power the storm must have had to pull this giant out of the ground. I borrowed this from the world wide web. I don’t know who is due credit for the poster, but I really like the quote. Last Sunday was a day of fulfilling orders, strategizing holiday stock and putting together a package for the wonderful salon in Portland that carries my line. This holiday season will be the first that I’ll be making jewelry for multiple outlets (hooray!) so I’m trying to be smart about the use of my time. As always. But! In the middle of working, this design came to me, and stopped to make it. It’s rather like a branch of cherry blossoms, so it’s little out of season, but I just read that winter cherry blossoms can happen! My good friend and first-ever customer came for a night of dinner and games the other day, and she wore her Blue Dot flower post earrings. (I do so love to see my jewelry being worn!) After pondering them from across the table, I had their shape on my mind. Those are the earrings, pictured below. The little flowers are more difficult to make than they look, but I find them to be worth it. Now they are part of a set! We’ve had quite a week here in NYC. It’s hard to find words for the life-changing news that we’re still hearing from devastated coastal neighborhoods in the wake of Sandy. Our neighborhood was spared. We have power and water, and stores around us are reopening. These resources have risen to the forefront of our consciousness, where they don’t normally dwell. We are reminded how fortunate and comfortable our lives are. 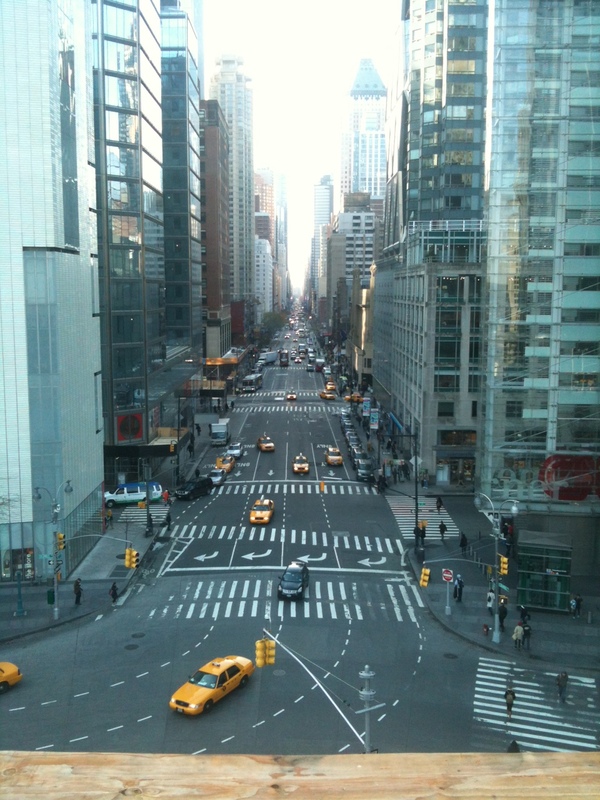 Today the city feels a little smaller, a little more vulnerable. And a little more united. This week, while at home, I created a few new designs. This is one of them, a rustic heart with imperfect lines. I also made an open heart, like my winged heart but without the wings, and a little more substantial. The holidays are nearly upon us. Hearts seemed like a much needed addition to Blue Dot. In the month of November, 10% of Blue Dot sales will be donated to the American Red Cross. Our hearts are with those dealing with the aftermath of the storm. Hoping for a speedy recovery, and grateful for the men and woman who will be doing that hard work.